Sitting at the tiller is exhausting. It requires constant attention, minor adjustments, and absolute focus. 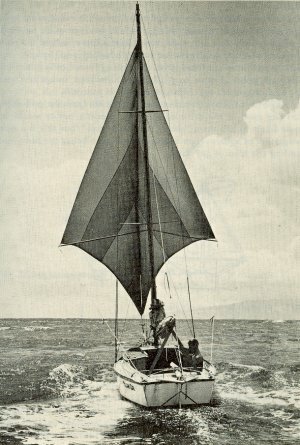 Without self-steering, the single-handed sailor gets no relief while under way -- and any relief that might come while hove-to is accompanied by the haunting knowledge that distance gained while sitting at the tiller is now being lost. Even with a crew, self-steering gives everyone more time to lay around together, talk without distraction, play chess, cook, etc. The best self-steering solution is probably a windvane gear. They have to be custom made for most boats, though, so buying a commercial vane would cost almost as much as my entire boat did. Building a windvane yourself is possible, but that usually requires welding and access to a machine shop. The alternative self-steering systems can be just as reliable, and they also help to cultivate an enhanced understanding of sail trim, sail balance, and the forces that are at work as your boat moves through the water. Once you finally get a self-steering system worked out, it's a great feeling to stand on the bow as the boat sails itself along. A critical self-steering concept is that your boat should be able to sail itself most of the time. 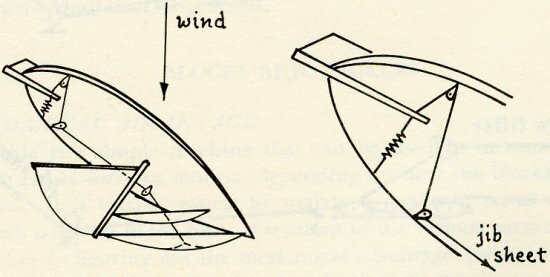 The idea is that it's possible to balance the boat on a fixed heading using the sails alone, and that any extra self-steering equipment is only to correct for wind variation or wave motion. This makes it necessary to understand the basics of sail balance. 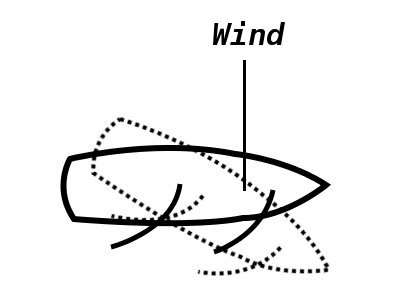 In the right diagram, as the wind hits the main sail, that pushes the aft of the boat to leeward and the bow rounds up into the wind. 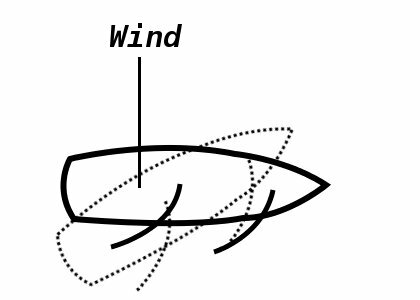 The exact opposite happens when wind hits the forward sail, pushing the bow to leeward and rounding the boat off the wind. In reality the wind is hitting both sails at the same time, so if the sail sizes and trims are balanced correctly, only forward motion (with a negligible amount of side slippage) will result. If only one sail is up or one sail is much larger than the other, the results will be predictable. 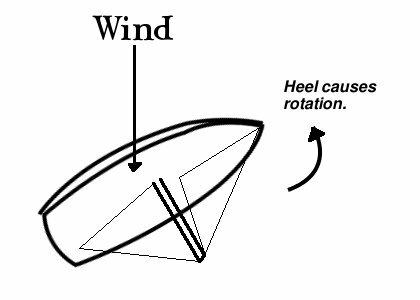 While sailing on a close reach, sail balance is complicated by heeling. As the apparent wind increases, the boat will roll to leeward (moving the mast and sails off to leeward as well). This causes the mast of the boat to act like a lever arm that is no longer pushing directly forward, but rotating up into the wind. The boat will now have a tendency to round up, which must be corrected for by the tiller. This is what's known as weather helm, since the boat is constantly trying to go "to weather." A little bit of weather helm can be alright, but too much will defeat any self-steering system and give you a really sore arm. 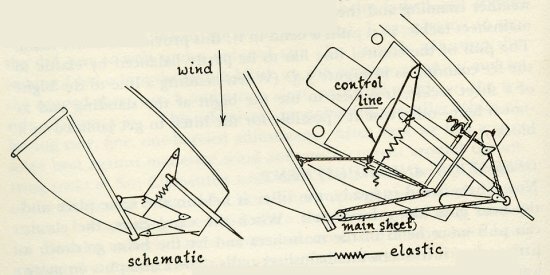 Knowing what we know about sail balance, in these conditions it's possible to correct for weather helm by adjusting sail balance. We could, for instance, reduce the size of the main or increase the size of the jib. Like-wise, we could sheet out the main so that it catches less wind. Both would have the effect of using the sail balance to counter-act the forces of weather helm. The basic premise of non-windvane self-steering systems is to balance the tiller using some feedback from the mainsheet or jibsheet. There are different ways to do this effectively, depending on the point of sail. The basic idea is to start by balancing the boat. Then use the force of the main sheet to increase the pull of the tiller to weather during puffs, and reduce the pull of the tiller to weather during lulls. 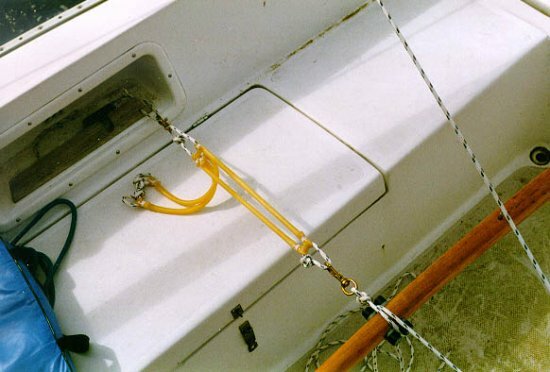 If the main sheet is connected to the end of the boom, this is done by attaching a control line to the main sheet, running it through a block on the weather-comb of the cockpit, and fastening it to the tiller. 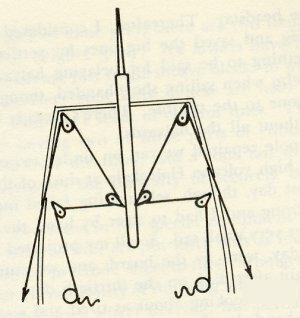 For an opposing force, connect lengths of elastic from the opposite side of the cockpit to the tiller. It takes some experimenting to figure out how strong the elastic and weather helm control lines needs to be. The point where the elastic goes slack should be when the tiller is exactly center or slightly to leeward. This means that if you need more tension on the elastic, it is necessary to connect an additional piece, rather than pulling an existing piece tighter. Otherwise the elastic will not go slack until the tiller is well to leeward. A close reach or close haul is a stable point of tack. As the boat falls off course on these tacks, the wind forces tend to automatically correct it. If the boat sails too far up, it will luff and fall off. If it sails too far off, the weather helm will increase and push it back up. Unlike a close reach or close haul, the broad reach is not a stable point of tack. If the boat starts to drift off course, the forces which initially moved it will only increase until the boat is changing direction faster and faster. This makes self steering systems even more important for a broad reach. It turns out that a correctly trimmed jib sheet is incredibly sensitive to changes in direction on this tack. If the boat falls off the wind any, the jib is blanketed by the main and the jib sheet goes completely slack. If the boat heads up any, the jib is hit hard and the sheet becomes extremely taught. If your jib is small enough, you can hook it directly to the tiller as the weather helm control line, balanced by a large piece of elastic. 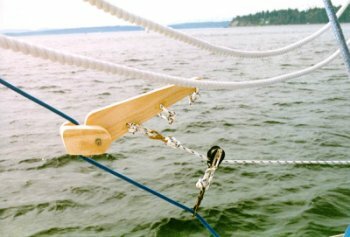 If the tension on your jib sheet is too much for a direct connection to your tiller (strong winds, large jib, etc) -- it is possible to build a lever which can measure the tension in your jib sheet instead. The best method for long runs straight down wind or slightly off the quarter is the use of twin headsails. This requires that you sew two identical headsails with staggered hanks, most likely out of 4.5oz spinnaker nylon. These can be flat, so it's just a matter of cutting the fabric, sewing the hems, and reinforcing the clews. With two identical headsails, it's possible to pole them out on either side, then connect both sheets directly to the tiller. 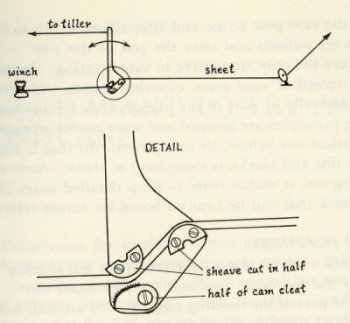 If the boat heads off the wind in one direction or another, the windward sail will tighten (increasing windward tension on the tiller) and the leeward sail will loosen (decreasing leeward tension on the tiller). This should immediately correct the course and continue to hold steady. For trans-oceanic passages, many people find the trade winds, put twin sails up, and don't touch the tiller again for a month.